University of Maryland Medical Center (UMMC) is a university-based regional health care system bringing innovation, discovery and research to the care they provide, all while educating the state’s future physicians and health care professionals. The UMMC Physician Referral app went viral among providers as the most efficient way to refer patients into the University of Maryland system. Specialty care providers play a huge role in the American healthcare system, and over ⅓ of all U.S. patients are referred to a specialist every year. However, anywhere from 25-50 percent of referring physicians have no way of knowing whether their patients even see the specialist to which they were referred. Additionally, 70 percent of SCPs rate the information that they receive from other providers as ‘fair’ or ‘poor’, a gap in information sharing that may lead to expensive and unnecessary care, potential medical errors, and repeated medical tests. This can lead to a frustrating experience for patients, wasted time for providers, and an unnecessary expense for payers. 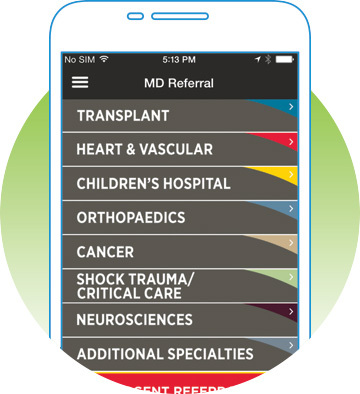 UMMC’s MD Referral app addresses this by promoting greater care coordination, improving the timeliness and quality of treatment plans, and increasing patient volume to maximize ROI. At a cost of $470 per unnecessary test, the value of an efficient mobile referral strategy becomes quickly apparent. The MD Referral app saw 327 uses each month and over 3,900 referrals per year. Preventing one unnecessary test per coordinated referral saves the system $1.8 million annually by improving care coordination. Additionally, the app can help prevent referral leakage, preserving revenue for the hospital. UMMC has seen 526 cancer specific referrals in 2018 alone, and cancer care costs average $17,624 per year, bringing annual app referred treatment of cancer patients to $9.3 million.